FaceTime has long been expected to support video calls over 3G networks, but thus far it hasn’t happened without a jailbreak. 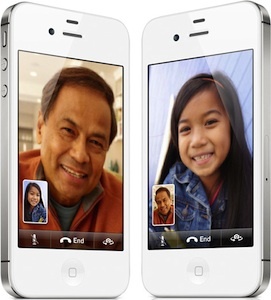 Blame it on the carriers, Apple, the rain, maybe 3G is too slow, or maybe it will be a feature for upcoming 4G LTE iPad and iPhone hardware… who knows, but regardless you can use a little loophole to initiate FaceTime video chat over 3G connections without the need for jailbreaking. Suddenly you can make video calls over 3G. Not the best solution because it requires additional hardware, but apparently it works. With the untethered 5.01 jailbreak, why not edit a plist file and have unrestricted FaceTime? Even if you use a jailbreak for nothing else… this is so easy why not do it? I was hoping iphone could connect to itself but no such luck. I can use skype video chat on my android phone over 3G without any problems. As long as the reception is good. Skype is not blocled by the carriers. And by the way: Where is iChat for iPhone? I am Nitin Jain from India. I was also facing same problem!! I put in New Delhi, India. But i use to travel a lot cause of my work. And finding Wifi in India is not an easy stuff. I believe, person having iPhone’s must be apple freak and it’s obvious that you people carry your own MacBook’s. 1. Open Personal Hotspot in your iPhone. Note: Close the Wifi before you open it. And ask it to use over Bluetooth or USB. 2. Then Open Mac’s Preference’s Panel. Note: Don’t Mark it. Just open it. 5. On above selection : Choose the source of Internet in your Mac. Say: If you are using iPhone USB then select it. 7. You can set password for sharing the Internet. 8. Now, open your iPhone: Turn on the Wifi. 9. Select your own Mac. Now actually you are using your 3G connection. Crafty solution, thanks for sharing this!